By Jennifer Cording, Delmarva Media Group Correspondent Priscilla was angry and moody. Mila was gentle and sweet. The pair looked just alike, but their personalities were quite different, says Karen Davis, who cared for them. When Priscilla got mad, she'd get red and purple in the face. Only Mila could calm her. In fact, when Priscilla paced the fence, ready to fly into a rage, Mila rushed to settle her. Mila would place her body between Priscilla and the object of her wrath. And Priscilla would calm down, just that fast. It happened often, Davis says. Of course, moody Priscilla and sweet Mila were turkeys. They lived on a farm where Davis worked a while back. They were production-farm turkeys, says Davis - bred for their meat, not longevity - so they lived a few years, and then they died a natural death. "It reminds me every day of why I'm doing what I'm doing," Davis says of the relationship between Priscilla and Mila, turkeys who evaded serving as a main meal when their slaughter-bound truck wrecked on the way to a processing plant. With Thanksgiving next week, turkeys are on Davis' mind. Actually, they're always on her mind, along with chickens, peafowl, guineas and birds of every type. It's why Davis spends each day educating people about them. It's why she and others will be in Washington D.C. on Sunday passing out leaflets about why "Turkeys are Too Neat to Eat." According to Davis, Priscilla and Mila were a classic case of poultry displaying distinct personalities and even empathy - not traits typically associated with turkeys, or any fowl, she says. It's why Davis' poultry sanctuary, United Poultry Concerns, in Northampton County, took flight. She believed chickens, turkeys, peafowl, guineas and other birds were getting a bum rap. Calling someone bird-brained, after all, is not a compliment. And, Davis says, it's name-calling that demeans fowl so people don't think twice about how they are treated. 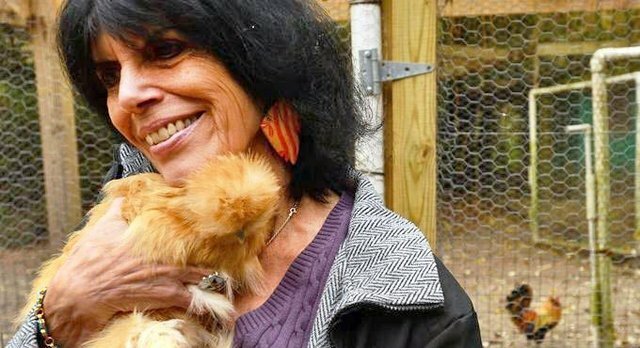 She decided to give a home to refugee fowl. It was bold to move the operation to the Eastern Shore. In Accomack County alone, there were 6.7 million chickens grown agriculturally, according to a 2012 U.S. Department of Agriculture census. Driving up the dirt lane to Davis' Eastern Shore-style white farmhouse, it soon is obvious there's something a bit different about this country homestead. Attached to the traditional-looking farmhouse is a large wire compound. The structure encloses trees, numerous buildings - and of course, a lot of chickens. Davis emerges from the house. She's a petite woman, with a quick and friendly manner. She's across the yard and introducing herself before a reporter can gather a notebook. This is not a woman used to dealing only with chickens. At one point, she jokingly refers to herself as "that crazy chicken lady." But it's clear she's as sharp as a spur on one of the roosters she's worked to save. In fact, Davis holds a Ph.D. in English from the University of Maryland-College Park, where she taught for twelve years in the English department. Her professional and activism biography is far too lengthy to list, but it includes numerous books, professional articles, essays and op-eds in many major newspapers and magazines. A feature on Davis in The Washington Post won a major journalism award. Her invitation to a National Public Radio host to visit United Poultry Concerns, then in Maryland, resulted in his televised admission on the The Late Show with David Letterman that he became a vegetarian because of Davis and meeting her chickens "There's nothing like knowing the birds in a personal way," says Davis of such encounters. "It gives you a credibility when talking to people about these animals." Davis does not remember a time when she didn't feel a kinship with birds, even as a child growing up in Altoona, Pa. Somehow, birds reminded her of angels, she says. "There was something about their faces, feathers and wings," says Davis. "I can't even explain it." There was one chicken that started it all. Her name was Viva. It was 1985. By then, Davis was married. Already she had moved across the country to San Francisco and back again. She and her husband were living in semi-rural Maryland. One day, through the trees at the back of their property, Davis noticed a commercial chicken house on the next property. She peeked inside. She knew little about chickens then. She was a typical suburbanite, she says. Davis visited the chickens nearly every day, peeking through the windows of the chicken house. One day, in the late summer, the chickens were gone - almost all of them anyway. When Davis looked inside, she saw something move. It was a chicken. A lone hen had been left behind. It had trouble walking, she says, but it still was looking for food and water in the deserted chicken house. Davis took the chicken home and named her Viva. The hen lived in Davis' yard by day, with a bed by the stove at night. Over the next three months, Viva's body failed her - her legs were not able to support her body. It's a common occurrence, says Davis, in chickens that are bred to mature quickly for their meat. A veterinarian euthanized Viva. The vet thanked Davis for caring about a chicken. Most people wouldn't have cared, the vet said. By 1990, Davis had founded United Poultry Concerns, later moving the operation to the Eastern Shore. Davis has a remarkable memory. Each of the 112 birds at her sanctuary has a name, and she can tell you the date and circumstances under which it arrived. There's Natalia and Natasha, who are elderly and among several birds who live on the enclosed porch with blankets at night. Belinda, Buffy and Amber are called by name. Desiree is a game hen from Alabama. She's the longest-term resident at the Machipongo farm, arriving about 2000. She's practically blind, now. But she trusts Davis, and she rests contentedly in her arms. Lorenzo is from North Carolina. Mr. Sippy, a "cheerful" blue-and-red rooster, is from Mississippi. Makenzie arrived partially de-beaked with his comb cut off - not uncommon for roosters, says Davis. Makenzie was "very scared and timid," says Davis. "He was very traumatized." It took a long time, but Makenzie finally came out of his shell. He has lived in the sanctuary for six years now. There's the peacock named Frankincense, who wandered up one day. Davis' sanctuary assistant, Wayne Wills, also a local building contractor, helped lure Frankincense inside the house with peanuts after the peacock persisted in watching Davis through a window in her office. Now, the bird is inside the protected enclosure, too. Davis admits that some flocks arrived looking so much alike they must share a name. Each hen in one group of white chickens is Sentimental Sweetie, for example. Another group of 50 hens from California are Earth Angels. The birds don't seem to mind. Not every bird is a sentimental sweetie, however. In fact, there's one rooster, Bisquet, who seems to hold a grudge against Davis, though she has given him refuge in a world that can be bleak for a chicken. It's a competitive thing, she thinks. She's the boss, and he wants to be in charge. Bisquet has gotten, well, a bit cocky. Davis holds a rake in defense when he's out of his pen, just in case. But, fighting off a rooster with a rake - it's a small battle compared to the war she's been fighting. And Davis knows it's not a war she's winning. Housing 112 chickens isn't a dent in the millions of chickens raised on the Shore alone for slaughter each year. But that won't stop Davis and her fight. She is 70 now, though she looks and moves as if years younger. The fight is what keeps her going, she says. "To get bad news all day, every day - it reminds me every day of why I'm doing what I'm doing," says Karen Davis. "I really put chickens on the animal-rights map." It's a war worth fighting, and a legacy worth leaving behind, she believes. And Thanksgiving is a season that doesn't need a turkey – or any bird – to celebrate, she says. "Thanksgiving is about giving thanks," she says. When fowl aren't part of the festivities, "then, we can truly give thanks." "Win or lose, this is what I do," she says.